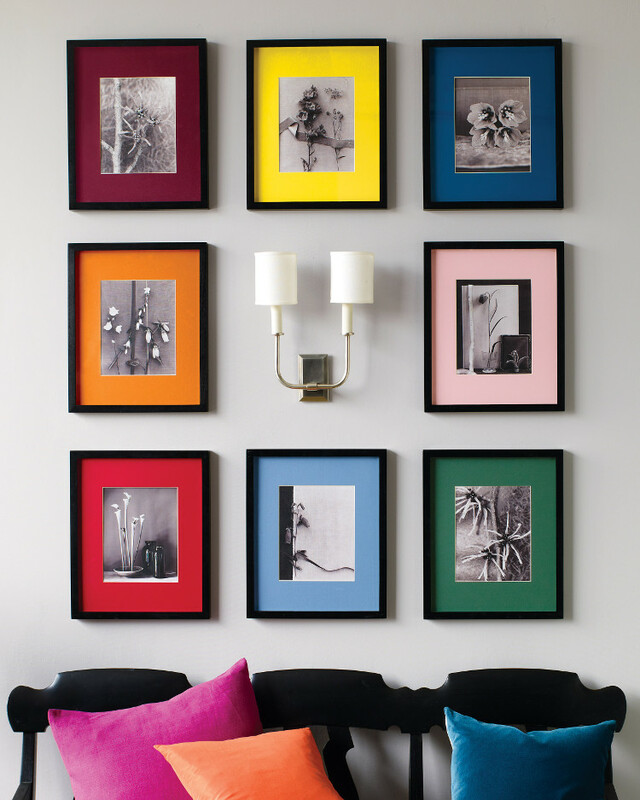 Compose a color picture wall using frames, mats or a vibrant background with neutral or colorful images. I’ve fallen in like with the idea of a color picture wall. In my dining room, I have pale green on the wall behind the pictures and my frames are white — very trad. So I was extremely intrigued by a few different strategies I spotted for adding color to walls. Many prefer neutral, or even black and white and calm. But great color can make walls come alive — in a good way. Anyone lucky enough to have a set of six John Baldessari works on paper [top] will want to make them a focal point as fashion designer Veronica Toub did in her Paris living room. The prints are simply framed in black and not matted so there’s nothing to interfere. They are abstract faces in bright hues and really jump off the pale gray wall. 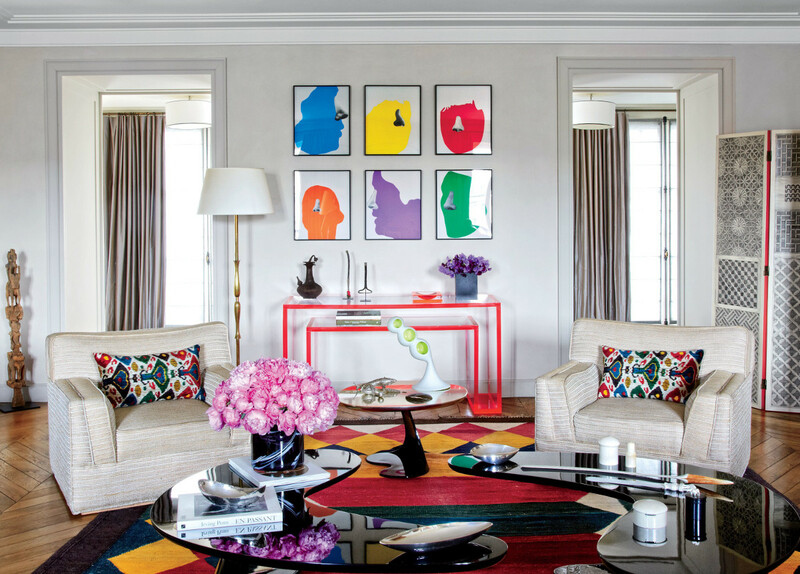 The choice of the red-edged lucite console below the pictures helps bring the color on the wall into focus. This is my kind of picture wall. Using colored mats to frame black and white images reverses the color roles— even when the frames are black. Here, mat color dominates the wall. This is a clever idea and a stylist’s trick. For me, it’s a great way of creating a wall that coordinates perfectly with accessories. Picture placement on this wall is unusual as it encircles a sconce and integrates it. It also makes the sconce look a bit like sculpture. Anyone seeking multicolored picture mats will find them here. 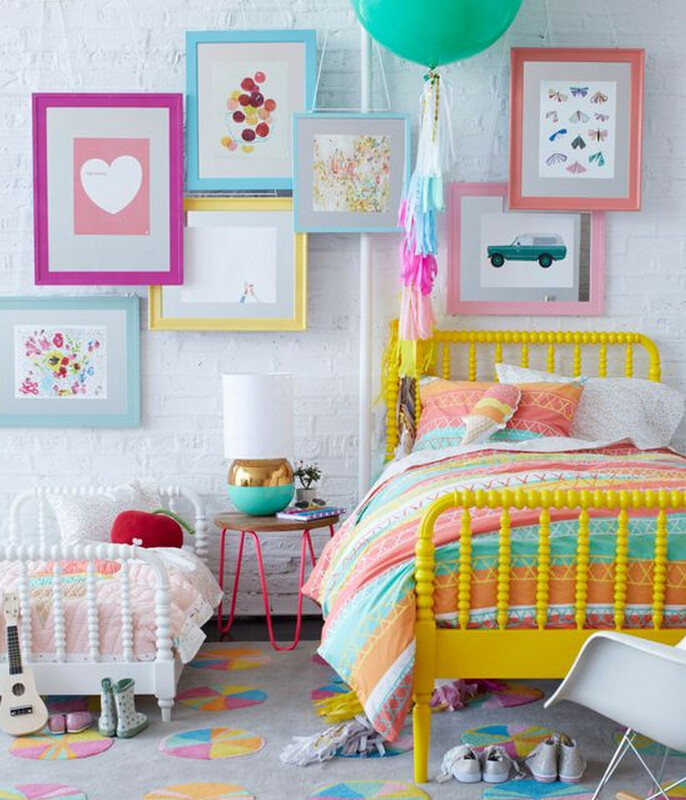 Candy color is to be expected in a child’s room so a variety of Jellybean frames add to the fun. 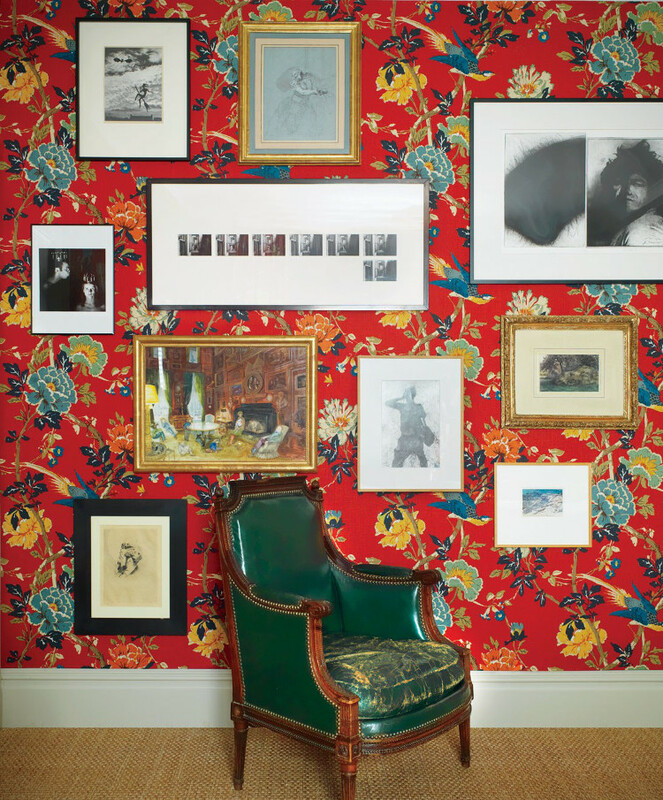 What’s different on this wall is that a few of the frames overlap — almost like a collage. One hangs in front of a water pipe that runs through the space. This is a unique layering style that eliminates the need to space out the frames. The adorable spool frame Jenny Lind beds are made for a wall like this one (or the reverse). 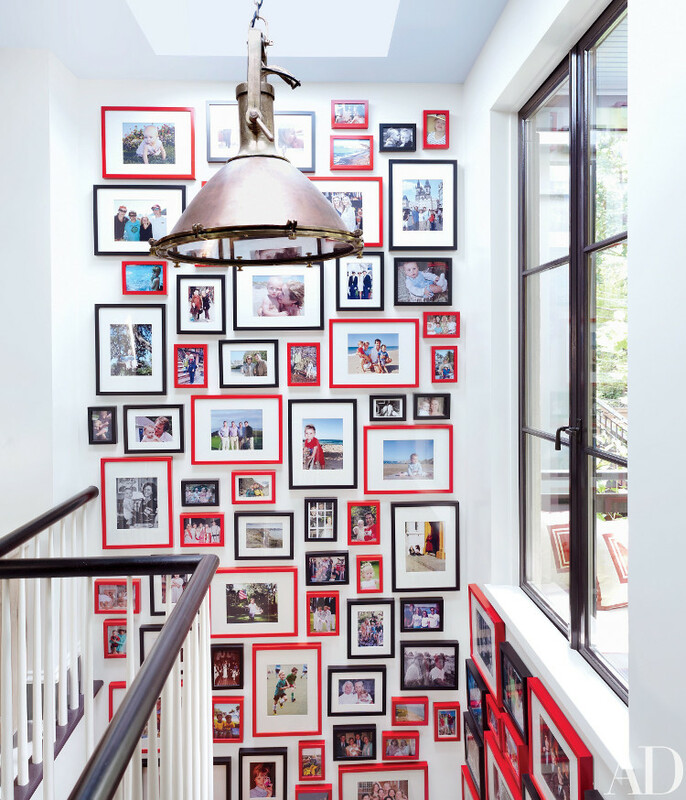 Here’s an object lesson in how to take a blah two-story stairwell wall and make it a looker. Red and black frames hung randomly (don’t think this is easy to accomplish on a ladder) look modern and the massing is so dense and all over that it basically reads like wallpaper. It’s also a way to revisit special moments every day as you pass through the house. Having a Louis XVI fauteuil done in old billiard-table-green leather helps. This is a serious antique floating in a bedroom and showcased in a most unique way that includes using Duane Michals photos mixed with antique etchings. But think about it: there’s a really bold wallpaper here and if it weren’t for the way the pictures are arranged around the chair it would be as noticeable. That red background and the large scale print flowers would just be overgrowth. Here the plantings are tamed in a very design-savvy way.